Among his contemporary countrymen, the Russian Alexander Mosolov certainly underwent one of the most individual developments. 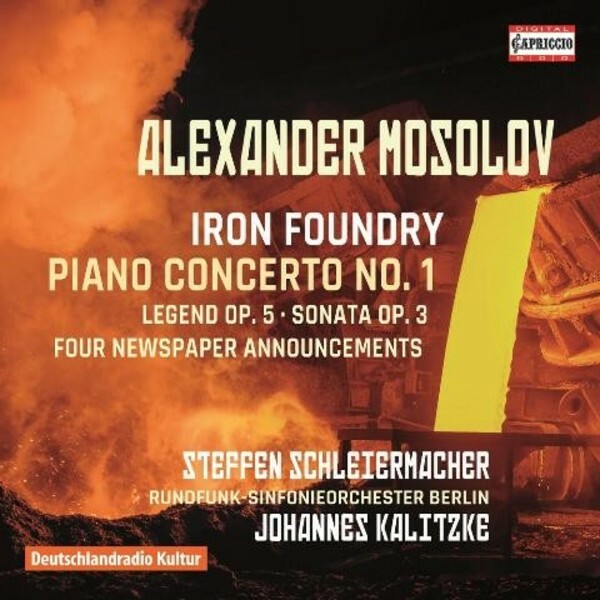 Most of his compositions have remained unknown both in the Soviet Union and abroad, but a single piece has ensured that his name has stayed lastingly present - the Iron Foundry from the ballet �Steel� (1926/27). It clearly ran contrary to the demands of �Socialist Realism�, gradually becoming established in the post-revolutionary Soviet Union and finally declared the official dogma by the authorities in 1932. Whereas the state demanded a kind of music that was easy to receive and could be directly accepted by broad sections of the population, some young composers saw themselves facing the challenge of keeping pace with the international avantgarde and adding a separate Russian and Soviet form. Also active as a music official, Mosolov quickly found recognition in the young Moscow music scene. He soon worked in the Association of Contemporary Music (ASM) and got to know many foreign colleagues, whose works were performed in Russia at the time not least due to his efforts, including Alban Berg, Paul Hindemith, Alfredo Casella, Darius Milhaud and Arthur Honegger.